A complaint was lodged at the Commission to Investigate Allegations of Bribery or Corruption (CIABOC) yesterday stating that Speaker Karu Jayasuriya has abused his position. The complaint was filed by the National University Lecturers’ Association. It states that the Speaker has abused his post as per the Article 70 of the Bribery Act by first stating that he accepts Mahinda Rajapaksa as the Prime Minister and then issuing a statement which says that he accepts Ranil Wickremesinghe as the Prime Minister. 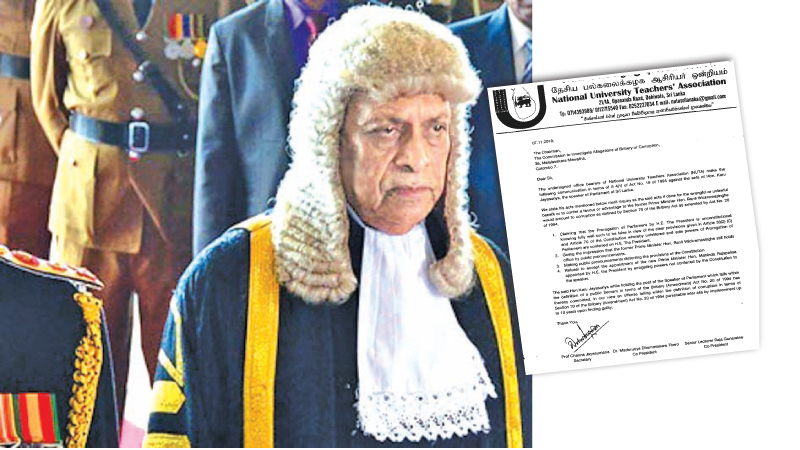 Open University Law Faculty Dean Dr. Raja Gunaratne explained that the Article 70 of the Act says that if any public officer uses the powers vested in his post to act in a manner that gives a benefit or advantage to another person it amounts to ‘corruption’. He also said that the Act is clear that a person who is guilty of the above offence could be subjected to maximum 10 years’ jail sentence. He said the Speaker and the officers have to execute the orders of the President as per the penalty article two of the Parliament Privileges Act. As he has contravened this provision, the Speaker has committed the offence of abusing his post, he added. Association Secretary Prof. Channa Jayasumana said the recent conduct of the Speaker has led to serious doubts. “The Law Faculty lecturers in the Association said legal action could be instituted in this regard. Therefore we submitted this complaint to the Bribery Commission. We have doubts as to why the Speaker changed his stance within a few days. He could have done so under pressure of some other party or to get an ulterior advantage or due to aging. However, such contradictory statements are against the Constitution, ethics, traditions and the aspirations of the majority of people. Therefore we hope that the complaint will soon be investigated and legal action be taken,” he added. Ven.Maduluwe Dhammissara thera and Dr. Nemsiri Jayathilake of the Association also participated.